This week, we enjoyed a brief visit from our niece, Rachel, who has been in Ireland for several months. She headed back yesterday, and made it safely. We will miss her (again) but are so happy she gets this opportunity. 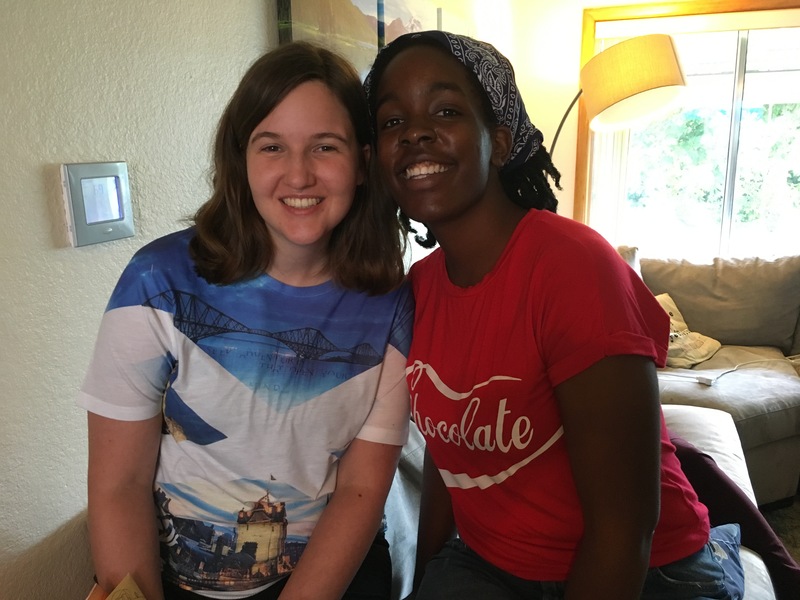 She is on a YWAM (Youth With a Mission) base in Ireland, doing an Arts and Media track. During her time there, she did many things including training, traveling to SE Asia with her group and, among other things, helped make a video for a donut shop, and did a peace walk along the border of Ireland. The walk was over 200 miles long. It was very interesting to hear of her adventures. I don’t even begin to pretend to know all the things she did–our time was too short. But, we did have a lovely family barbecue in her honor. It was so much nicer to eat here at our house, vs. a restaurant. There was so much more time to talk. Rob barbecued both chicken and steak. People brought things to share. Yum! One of my orchids bloomed. The bloom is small, but beautiful. I have another one that looks like it may bloom in time, as well. 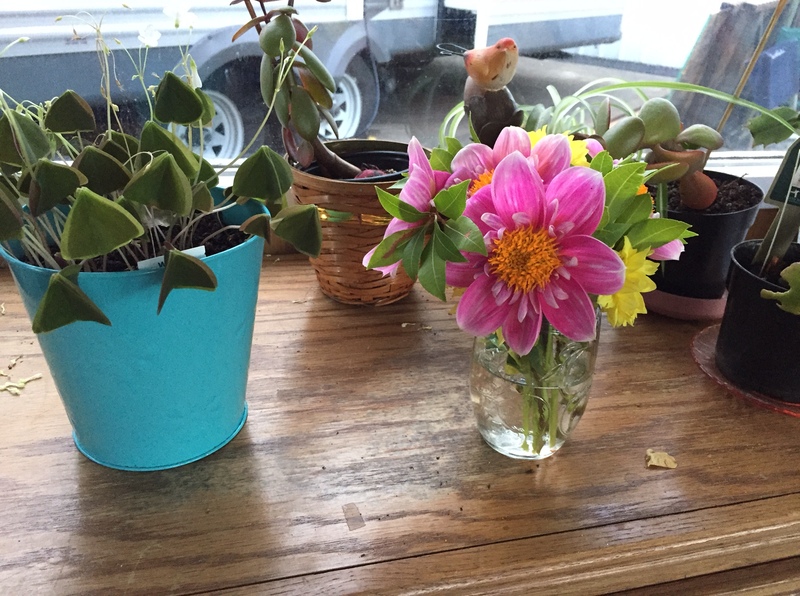 Patsy made a bouquet to liven up our outdoor living area for the barbecue. Our flowers are blooming well in the flowerbeds and the garden is growing madly. We have tried to trim off the spent blooms to keep the blossoms coming. We are also watering frequently because it’s been pretty warm. Thankfully, we have a well for watering, so it doesn’t cost much. I have cooked many things this week. I made lasagna, chicken soup, tacos, barbecued chicken and steak, and lots and lots of salad. I froze a lasagna for later, and also individual servings of both the lasagna and soup for both Rob and I next week. We had lasagna one day, and tacos another day, then had the leftovers of both today after church. I cut up a cauliflower and a lot of carrots to make it easy to cook them at mealtime. I am thinking I will do that more in the fall when I’m working a lot into the evenings because it made it so easy. I made the sauce for the lasagna from home-canned tomato products, frozen hamburger and a bunch of Swiss Chard I picked from the garden. I had Patsy make apple crisp from some home-canned apple pie filling. I am still working on using the remaining items that I have in my canning cupboard. 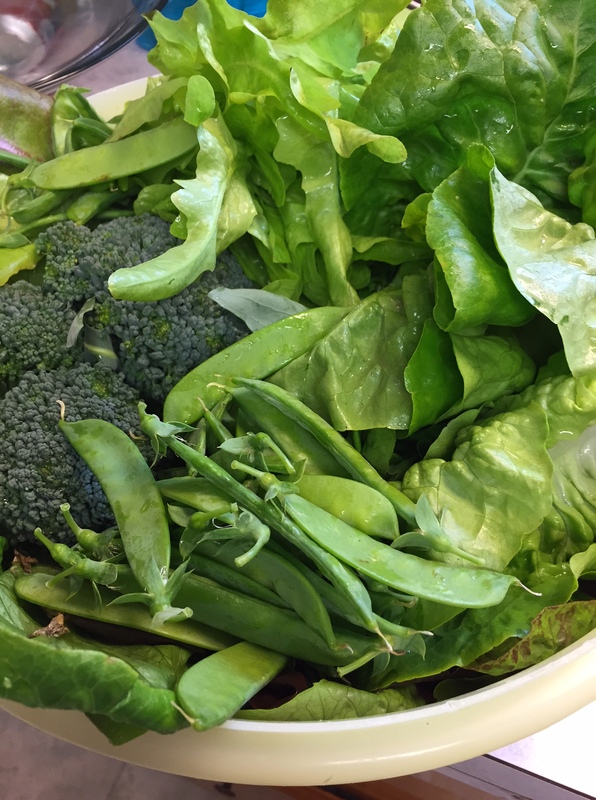 The garden is producing a lot of lettuce and we are trying to eat it most days. We have used both of the zucchini the bushes have produced. There are lots of little ones forming, but I am having some pollination issues, so some are not growing. We are getting a little broccoli every few days. The snow peas are done now, and I pulled the bushes. I have a small baggie of snow peas still in the fridge, and there is another short row that is blooming so I won’t be out for long. The green beans are making little beans–it will only be a few days now until I eat some. I will also can a lot soon. The 3 tiny tomatoes were eaten with tacos today. I was able to plant more seeds in all of the blank spots that opened up when I pulled out the peas and bolting lettuce. I figure that anything that can get ripe in 8 weeks will be ready in mid-September. We did quite a few more things this week, like visit Harnet, celebrate the 4th, and enjoy the garden. How did your week go? Thank you for the morning giggle…hungry bears….lol…the bears in your area are awfully cute!!! Thanks! Still, when I find applesauce and cans of soup ON THE FLOOR, I do want those bears to get their foraging habits under control:) Still, truthfully, Mama Bear likes to work outside in the flowerbeds and garden more than in the house at this time of year so a little more time on the house is clearly in order. Hopefully, this week will show a little more improvement inside! 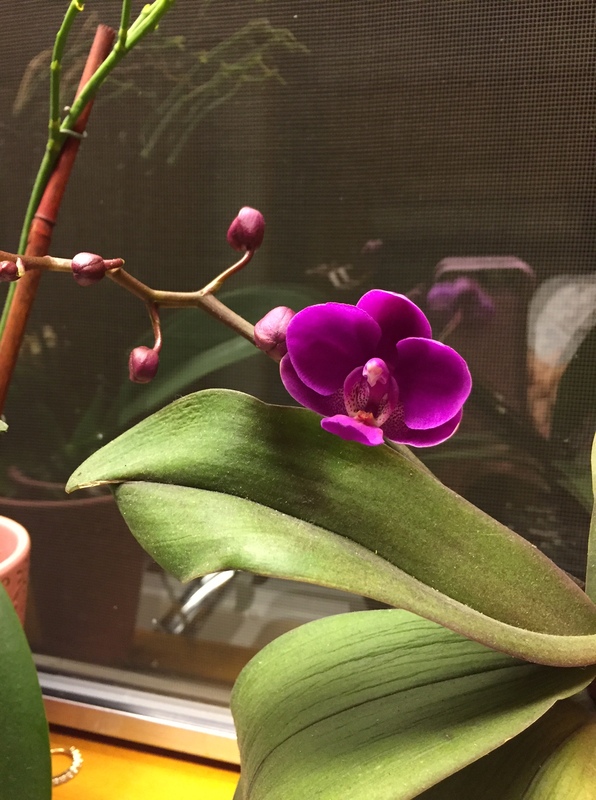 Congratulations on your orchid blooming! Nothing I do has worked here. Looks like Rob is in for a great week. This week we have another appointment with the brain rehab specialist for hubby. This has been hugely beneficial for him and he is doing much better. He still has a long ways to go before he would be able to work again. His job is largely problem solving which he just cannot handle right now. We are waiting to hear that he was approved for long term disability. We run out of short term on the 21st after which we have no income if the long term is not approved. I’m so glad you were able to spend so much time with your family and be at the lake, which you love. I hope and pray that they will hurry up and approve the long-term disability. I’m sure that’s a bit of a nail-biter. I have never enjoyed waiting for things like that, and feel for you. The one encouragement I can give is that we have lived through similar circumstances, and God has been faithful and cared for us through them all. So, hang in there! Absolutely! I don’t know why I did not say that, too. God has proven Himself to us over and over. Five years ago Hubby was without a job for 9 months. After he was back to work we had more in our savings account than when his job was sent to Argentinia. I took $1000 or ore out of the account every month for 9 months. We still cannot explain that! We had to pay $7750 out of pocket for Hubby’s 16 day stay at the hospital this year and after paying that our savings account balance is the same as before we paid it. We went over and over the numbers. No explanation once again. He is a good, good Father! UPDATE! Long term disability was approved through October. This is likely enough time for healing so that he can go back to work. PTL! Sounds like a great visit! I’ve been craving lasagna. I’m just going to have to get off my tush and make one. It is quite a process, isn’t it? 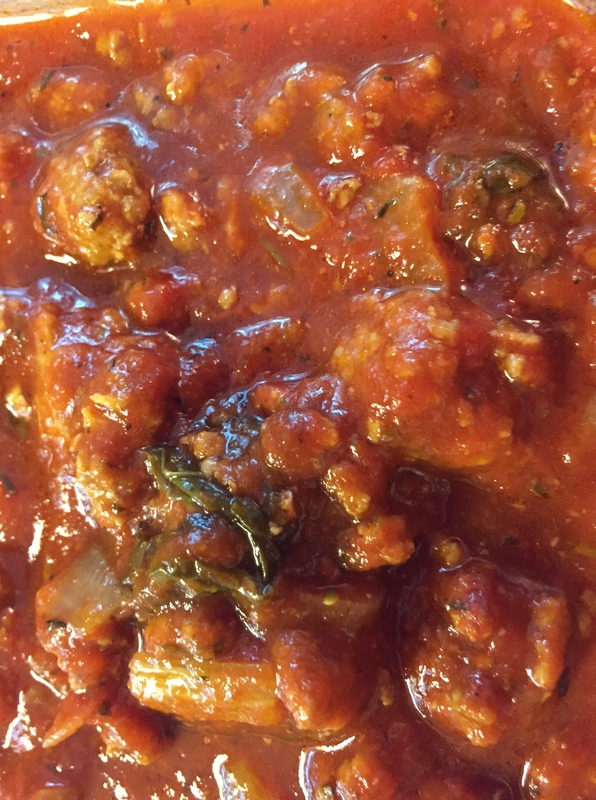 Because I made the sauce from scratch, it felt really good to have one to eat (2 meals), one to freeze (2 more meals) and 2 little single servings to freeze for next week. When I was in the store debating the smaller ricotta vs. the larger one, I figured–why not make a lot–the bigger ricotta was very little more than the small one. I used 1 box of noodles, and did one layer of very thinly sliced zucchini for each of the big lasagnas instead of noodles, and noodles for the other layers. So, it was the best of both worlds–some noodles, some zucchini noodles. I also grated up some cheese that was very cheap from Grocery Outlet and added it in. It has a stronger flavor, but was not noticeable mixed in with the mozzarella, parmesan and ricotta. It’s just getting started. Lettuce is my most prolific crop. We do leaf lettuce and start eating as soon as there are leaves big enough. Then, I planted out some single seedlings from my own row so they can grow into loose heads. So, it’s a quick crop. I’m hoping camp works out the way they said it would. He is one to jump in where needed (which is good) but I really hope he gets some fishing in as well. I am super thankful that there was an RV park a few block away. He just would not sleep if he was hot, in a tent, on the hard ground. He will be more useful this way. :) I’m thinking it sounds fun, too. But, I’ve got to get Patsy back, and work a bit, so I’m staying home this time. What a great week you had as well as your upcoming plans. The orchid is very lovely. I’ve been focusing on getting my meal planning and grocery shopping to be more streamlined. I made a 2 week menu plans and shopped for 2 weeks worth of groceries. That was last Monday and today was the first day I stopped at the store and only got milk! This week I want to make a master grocery list so I don’t forget things when making my list. I recently downloaded a Price Book app to my phone, but I keep forgetting to use it when I visit a store to see if I’m getting a good deal. LOL! I’ve tried every kind of menu planning I’ve ever heard of, but STILL have been winging it way too much lately. I loved the 2 week menu plan when I tried it. I’m feeling like it’s time to re-organize myself, as well. Good luck! Today, I straightened my food storage/pantry. I now know what I have. It’s time to use old things again, and I will work on re-stocking anything that is getting low. It was a very satisfying use of my morning. First, I do not begrudge Rob his air conditioning and soft bed! Nope. Everyone deserves that! Only the crazy or very young choose tents on the ground! Yikes! Tell Rachel I said walking 200 miles is great preparation for being a mother (some day) of toddlers. She will understand later. I am spending the week cooking for my boys. Yahoo! We are going to see them this weekend and I am planning on filling up both of their freezers with homemade TV dinners. I asked what they needed me to bring from my pantry – peanut butter and jelly. Oh what a bad sign. It means it is what they have been eating since they ran out of the previous frozen meals I fixed. That is my kind of fun, too, Jeannie! What fun! You go girl! Fill those freezers. You can always make yourself a few things, too, and be ready until the next time. Or, maybe they will just eat and eat and eat. Seriously, I love cooking for a crowd, and it’s good to know they will be eating good food, isn’t it? Living by myself, meal planning like I used to do just doesn’t work. The best I do is a list of pantry meals that I keep on my refrig. And, about once or twice a week I go to the grocery store for a ‘meat’ – usually chicken or pork chops these days. I buy enough for 2-3 dinners, cook them up the day I buy them and then have leftovers. If I’m out of the precooked ‘meat’ and don’t or can’t grocery shop that day, then I make a pantry dinner. So far that’s working for me. Yes it is good to know! I love cooking for them because they love my food! Look like you had a great week. The squash prob have blossom end rot. Sometimes comes from uneven watering because they can not absorb calcium as well. I have used powdered milk,bone meal and tums to combat this problem. It also could be from lack of pollination. Less bees, try using a paint brush or Qtip to hand pollinate. Mavis at one hundred dollars a month has a great description on her blog. Sorry I do not know how to insert a link. Thanks! It is true that they aren’t getting watered evenly. We spent quite a bit of time yesterday trying to fix the sprinklers so they would get more evenly watered. I’m not sure if we fixed it, but Rob is now gone for a week, so I’ll make out the best I can and if it’s not fixed, we will tackle it again when he comes home. We want the automatic sprinklers to do the job, and they just aren’t set quite correctly, yet. I have noticed that there are not as many bees here as there were at our last house. So, I’ll keep an eye out and see what works!